This entry was posted in Skip Allen & Painter 12 and tagged Corel Painter 12, Corel Painter 12 Watercolor Brushes, Corel Painter 12.1 video tutorials. Bookmark the permalink. Hi Skip… sorry I missed the webinar but there was something in my browser or OS system that did not permit me to join. I will look forward to seeing it on Utube though. The final looks great, and if I can get the webinar to work on my computer I would be willing to pay your fee for the next one. Keep up the great work, very inspirational. Drat…so sorry it didn’t work for you. I hope the recording will work for you. Thank you for stopping by and leaving a nice comment. I am looking forward to the day you can use your Painter 12.1. I would be happy to pay to see you paint. The same applies to Karen. Thanks Tony. Hope all is well down under! Skip, I can’t believe you don’t like this……and you did it in less than an hour while talking and answering questions. I think that is amazing and something most people couldn’t handle. I think your webinars sound like fun….and so considerate of you to think about the time zones. One or two dollars?? You are so funny !! You underestimate your worth !! Go for it !!! Judi, you are so sweet to me. Thank you for the compliment!! Painting live is hit or miss for me. Sometimes it works well…and others…well…that’s life. try the watercolor painting and see what happens. I am inspired. So I certainly would love you to do more webinars even with a slight charge. To see something being painted and be able to get a question answered at that time is, I think, the best way tp learn. I am so glad you enjoyed it. Watercolor isn’t easy digitally or traditionally, but all it takes is a lot of practice. That is distressing news about downloading the Hot Fix. You don’t have to have it, but it will definitely make your life painting more enjoyable with it. What kind of error messsage are you getting? I am not one to comment on fee based webnars considering my circumsatnces, but I am sure your other followers will love the idea. I just have to learn more about what you are talking about and I’m still trying to save for a Wacom tablet. I keep too many panels open. Less is best, but when I am demonstrating I like to have everything at my finger tips. Shoot Candace…you need to quit work and just play. Thank you so much for your kind comments. Regarding the fee, maybe you could set up a link for voluntary contributions. That way, those of us who can afford it can pay, and it will be available to those who cannot pay anything. Who knows, you may be nurturing the next Van Gogh in your teaching! I enjoyed your webinar Skip! It was my first webinar ever. I’m also taking your Basic Watercolor class and I’m learning a lot. You are so knowledgeable in Painter and give so much to us, not only your wonderful free brushes and tutorials, but the way you respond to our difficulties. You really care to work on a one to one basis to make sure we get things right to move on. You are such a great teacher, and artist, and guy! Your painting is beautiful! I really like the way it came out. Yes, I would pay for your webinars. You first Webinar? Wow, Corel has free ones every month. 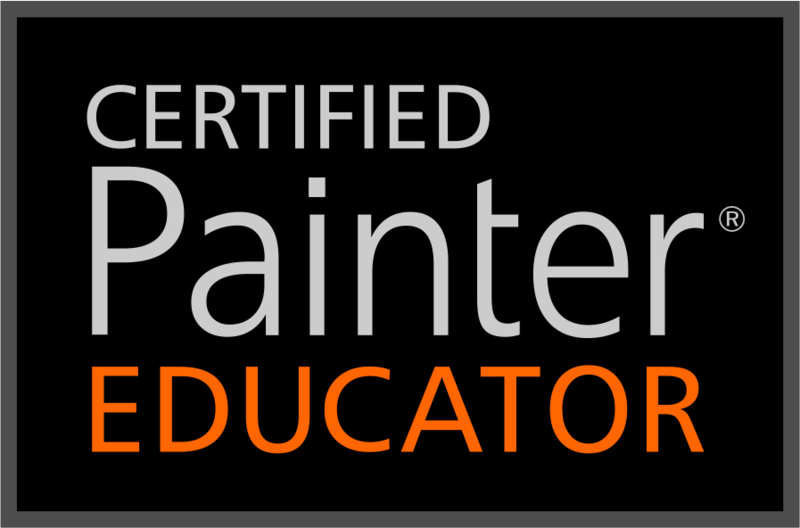 Subscribe to Corel Painter’s Face book page and you will get announcements of the Webinars. They are terrific. I think I am too old to change. I’m having fun and hope everyone else is too. Yes I would still attend for a few bucks. I’ve looked into Webinar costs and I know it’s not inexpensive on a monthy basis. I really do not want to charge; I am just figuring out my options. It sure would be fun to do these on a regular basis. Thanks for a great webinar. I participated even though I ony have painter 11. I used somedifferent brush but did a lot of experimenting whileyou painted. Really enjoyed. I’d be willing to pay a few dollars for webinars in the furute. I knew you would be painting along. You have such an adventurous spirit and you are a pleasure to have in my classes. I am devasted that I missed this. I didn’t know about it or I would have. I will check back at the end of the week to see if you have posted it. I would definitely pay a couple of dollars to attend. I think the painting is beautiful!!!!!!!!!!!! Skip, you are a natural teacher and artist. Not only are you a master Painter and painter but you deserve to be addressed as Herr. Doktor extraordinaire. I will always be trying to learn from your doodling and playing in this medium. I hope you can extend your expertise in brushes to oils and other media. OMGosh Heather…thank you bunches. You are the inspiration. I am so excited that you attended and made a comment here. You have made my day!!! Couldn’t you play sick? Honestly…life just gets in the way of our fun…phooey. Always good to hear from you Charlie and I love your art work!!! I thought I could make it back in time. Not!!! The good news is you made a recording…can’t wait to see it. The art work that you posted is just perfection. I have kept all your videos…from the classes I have been in with you…and I cherish them. I have all of my “Skips Brushes” too. Yes…of course…I would pay. My problem…is the time of day. I’ve been missing you. I’ll set up something to match your times. You are fun in class and live meetings. Thanks for the tip…also thanks for the tip you sent to me via email. I need the help…LOL. Glad to see you here. It was brilliant, Skip! You’re a star! Er…is that rising or falling? Thanks dear friend…see you soon in one of your webinars with Tim. Hey Daryl…boy do I wish it always turned out perfect…but, it doesn’t. I always think it works for everyone else, too, drat. The good news is that I am not worried about it…I love painting, experimenting, sharing, and just having fun. Thanks for your wise comment. The webinar was fantastic Skip. As far as constructive criticism goes …The soloist says “I hate my painting, I hate my painting” and the choir refrains, ” I love your painting, I love your painting”. That works! I loved your painting and what a great “tree brush” you demonstrated. I remember when you started on that mission. New webinars … great and even $5.00 – what a bargain. 🙂 My first out right laugh. I’m obsessed is accurate…now I do know what to say. Winifred thank you so much for your support and also for all that you do for the Painting community. I love your videos. Skip, I can not begin to tell you how much this video class helped me. You are such a great teacher. To see your brilliance in action was the icing on the cake. I would pay to attend these type of video classes. Not many masters are willing to share their secrets. Thank You! Great webinar Skip. I have been so involved with Tim’s PS painting that I have not been keeping up with Painter and am now so behind. 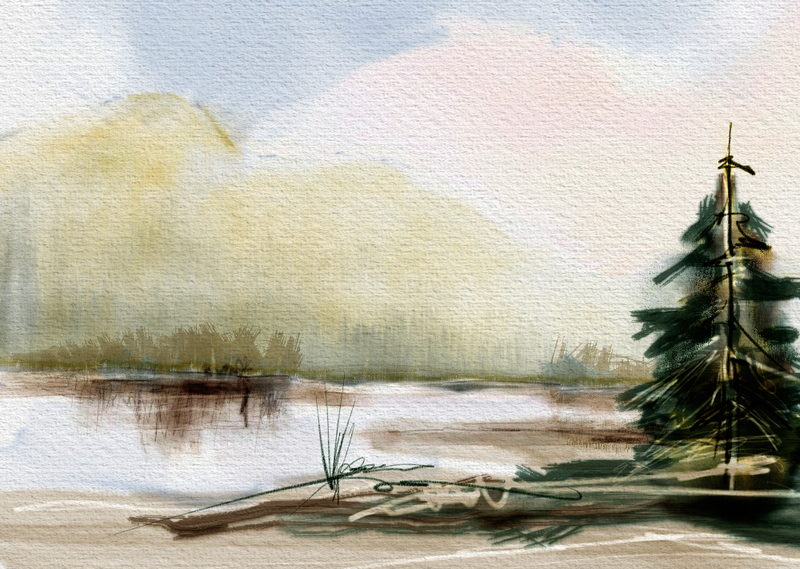 You have really inspired me to learn watercolor in Painter…….your class will be next. Would love more webinars. I look forward to seeing you in class. I love Tim’s classes…he is a great teacher. Hi Skip, you know I always love seeing you paint. You are the most natural teacher I have ever met. I have learned so much from you. I enjoyed your webinar very much. I love those new brushes. Can’t wait to give them a try . Along with your artistic talents and wonderful webinars, you are the most generous of all. You freely share your marvelous brushes and your great knowledge of Painter. You are a gentleman and a scholar. Skip, I attended your webinar today and thought it was fantastic, as was your painting. You make it look so easy. I would gladly attend more of your webinars, even if you have to pay to attend. I had a few questions about your classes on .DAA Is there a way I can e-mail you? I’m not finding an address. Or perhaps email me. By the way dear Skip … would I pay to attend your webinars??? Does a bear poop in the woods???!!! .. you have to know that there are many of us who will gladly follow you to the ends of the earth … and, we’re willing to pay for that priviledge!!!.. Great webinar Skip, I really enjoyed it. Of course I would be willing to pay to attend your webinars, they are well worth paying for, :). Hi Skip, I registered for the webinar, but somehow could not get on, so I am so looking forward to it when it becomes available. Can you charge a small fee? of course you can, we would all be there. I love your work. Just keep teaching! I will be posting the link shortly. It is totally free. I hope you enjoy it. You should charge for your webinars, but just a buck or two is hardly worth the accounting hassle. I like the Voluntary Donation Idea. Gotta go try those brushes. How do I open the brush files? Frist, you need to have Corel Painter 12.1. If you have that, I have a video called Brush Management in Painter 12.1. I think it will explain all that you need to know. If not, please let me know. HI Skip — greatly enjoyed the webinar, just an excellent job! I sent you a question about papers and you answered some of it on the Webinar, but, I don’t seem to find a way to get a (one or more) paper into the patterns library. I looked at Corels help but they use a different method (Effects, Surface Control …), (and I don’t find Karen’s information on her Blog site. Any chance you could point me to something that might be of some help? I’m so sorry, I thought I had answered your email. You can find Karen’s Papers at Painter Talk. If you are not a member, then join, it is free and a great group of folks. 1. Select the paper you want to be the pattern. 2. Use any number of ways to show the paper texture in an image. Stuff from Corel’s help files or as I did…by using the Channel command from the Channel Panel..New From > Paper. 3. Now you can load the selection from the channel and fill with a color…experiment…can be black. 4. From the image created you can capture a pattern using the Pattern Control Panel. There may be issues with seams, but if you lighten the opacity of the layer the seams will become less noticeable.